U.S. Surgeon General Jerome M. Adams, MD, MPH. 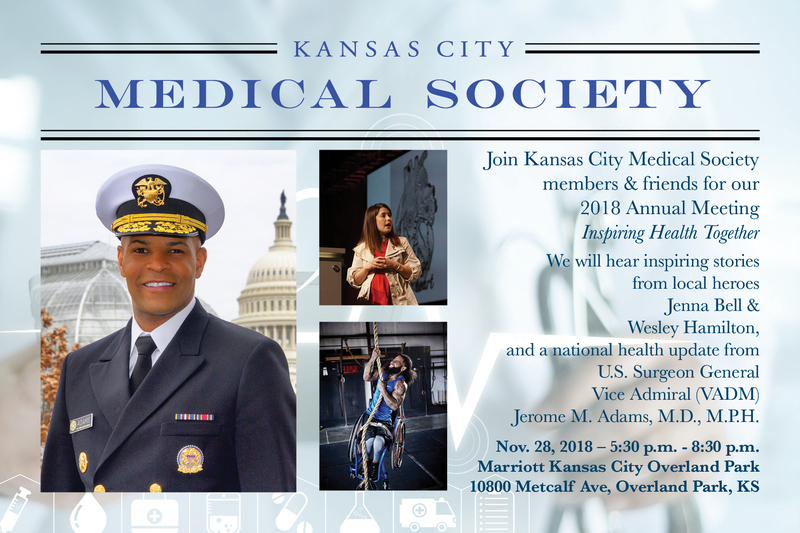 The Kansas City Medical Society is honored to have as our guest speaker at the 2018 Annual Meeting U.S. Surgeon General Vice Admiral Jerome M. Adams, MD, MPH. 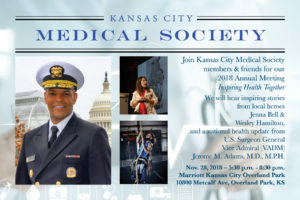 The Annual Meeting will be held Wednesday, Nov. 28, starting at 5:30 p.m., at the Marriott Kansas City Overland Park, 10800 Metcalf Ave., Overland Park, Kan. 66210. Dr. Adams was sworn into office as the 20th Surgeon General by Vice President Mike Pence on Sept. 5, 2017. A board-certified anesthesiologist, he served as Indiana state health commissioner from 2014 to 2017. Dr. Adams, a Maryland native, has bachelor’s degrees in both biochemistry and psychology from the University of Maryland, Baltimore County, a master of public health degree from the University of California at Berkeley, and a medical degree from Indiana University School of Medicine. In addition, Dr. Adams was an associate professor of clinical anesthesia at Indiana University School of Medicine and a staff anesthesiologist at Eskenazi Health in Indianapolis. He has served in leadership positions at a number of professional organizations, including the American Medical Association, the Indiana State Medical Association and the Indiana Society of Anesthesiologists. He is the immediate past chair of the Professional Diversity Committee for the American Society of Anesthesiologists. As Surgeon General, Dr. Adams has made the opioid crisis a priority. In spring 2018, he issued a health advisory on naloxone that explained the drug’s benefits and urged those at elevated risk of an opioid overdose or close to someone at high risk to talk with their doctor or a pharmacist about obtaining naloxone, learning the signs of opioid overdose, and getting trained to administer naloxone. In his speech to the AMA House of Delegates in June, he emphasized the need to remove the stigma associated with substance-use disorder, increase access to medication-assisted treatment, and to widen the availability of opioid overdose antidote naloxone. During his tenure as Indiana state health commissioner, Dr. Adams presided over Indiana’s efforts to deal with the state’s unprecedented HIV outbreak. He is credited with taking swift action to declare a public health emergency and implementing a multi-tiered response that included access to health insurance and HIV care and treatment. He also helped with the successful launch of Indiana’s state-based, consumer-driven alternative to Medicaid expansion and worked with the state legislature to secure more than $10 million to combat infant mortality in high-risk areas of the state. Dr. Adams’ motto as surgeon general is “better health through better partnerships.” As Surgeon General, Dr. Adams is committed to maintaining strong relationships with the public health community and forging new partnerships with non-traditional partners, including business and law enforcement. He has pledged to lead with science, facilitate locally-led solutions to the nation’s most difficult health problems, and deliver higher quality health care at lower cost through patient and community engagement and better prevention. 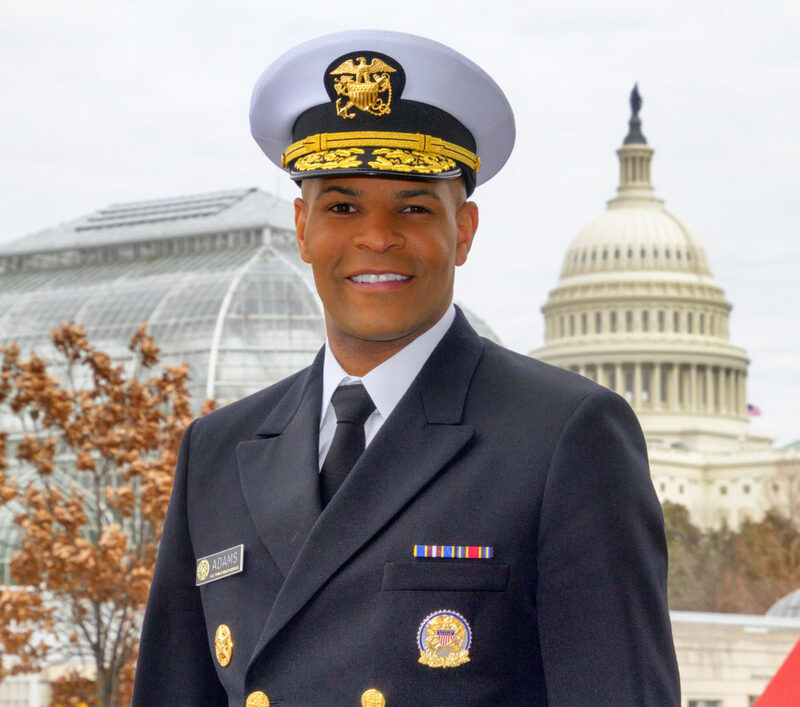 The Surgeon General oversees the operations of the U.S. Public Health Service Commissioned Corps, which has approximately 6,700 uniformed health officers who serve in nearly 800 locations around the world to promote, protect and advance the health and safety of our nation and our world. To learn more about this meeting, to sponsor and to get tickets please visit our events page!